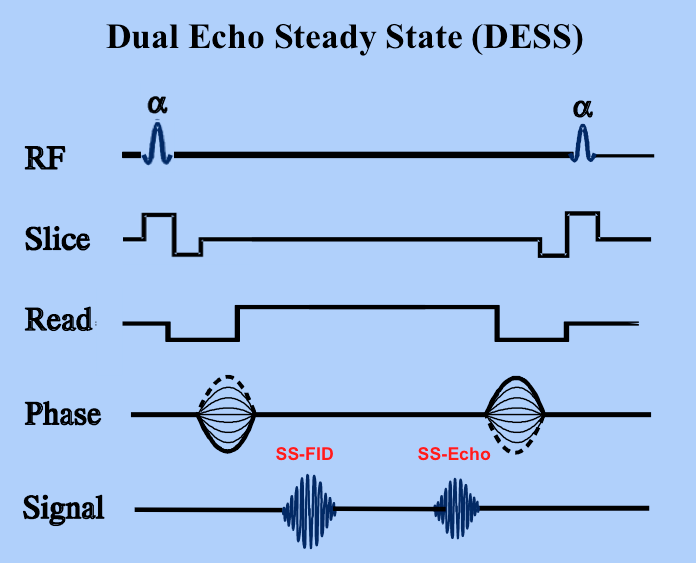 DESS stands for “Double Echo Steady State” and is a trademarked product by Siemens. In earlier literature, this sequence was known by the acronym “FADE (FAst Double Echo”). GE's version is called MENSA (Multi-Echo iN Steady-state Acquisition). By means of a prolonged and unbalanced readout gradient, DESS generates the FID-like and Echo-like signals from the steady-state free precession individually. It then combines the signals on a pixel-by-pixel basis, thereby increasing signal-to-noise. Phase-encoding and slice-select gradients are balanced to maintain the transverse steady state. The contrast of DESS is unique as it combines features from both the FID-signal of FISP with the Echo-signal of PSIF. Fluid is extremely bright (reflecting T2/T1 weighting from the PSIF echo signal). Bone is relatively dark due to T2* dephasing from trabeculae (reflecting susceptibility sensitivity of the FISP/FID component). The PSIF/echo contribution makes DESS very sensitive to motion, so its use has been primarily limited to orthopedic applications, such as 3D knee imaging. Bruder H, Fischer H, Graumann R, Deimling M. A new steady-state imaging sequence for simultaneous acquisition of two MR images with clearly different contrasts. Magn Res Med 1988;7:35-42. Thakkar RS, Fammang AJ, Chhabra A et al. 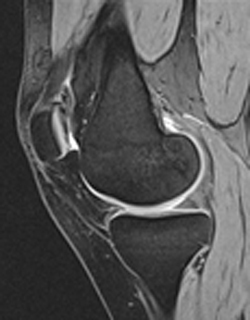 3T MR imaging of cartilage using 3D dual echo steady state (DESS). MAGNETOM Flash (3/2011), pp 33-6. There are so many different GRE sequences. Can you make sense of these?